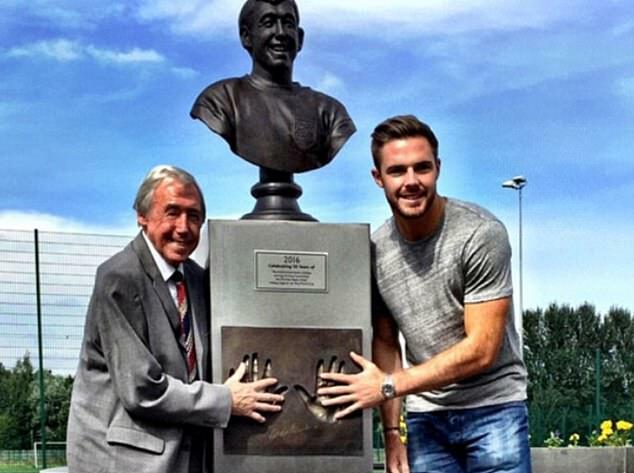 Jack Butland stood in front of the bronze statue of Gordon Banks that resides outside Stoke’s ground and gave personal reflection on why his passing will strike such a breadth and depth of emotion. 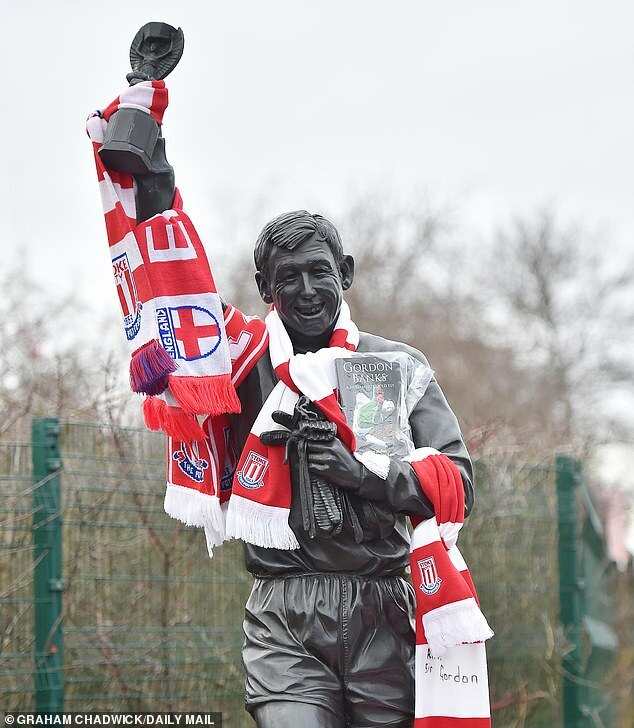 ‘I’m devastated like a lot of people are but it is time to remember who he was and what he was about,’ Butland said. 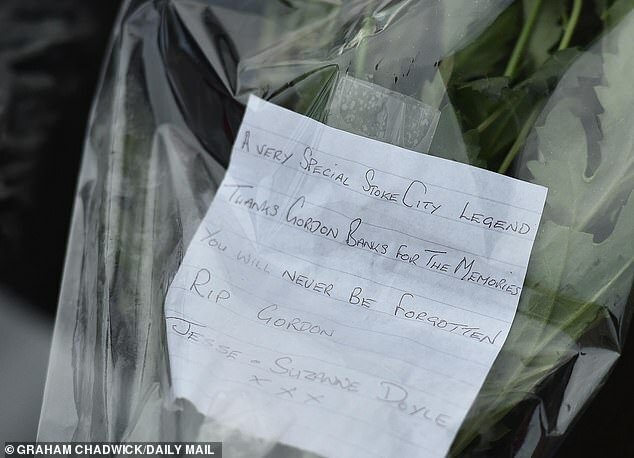 ‘He was an extremely kind and humble man, passionate about his football. He brought so much joy to people. Butland is two generations on from Banks but the passage of time had not dimmed the World Cup winner’s enthusiasm for the game. They would regularly talk goalkeeping. ‘He would speak about the way he used to train with sandbags on his shoulders and how we had a fancy gym with posh weights,’ Butland added. ‘We talked about defending corners and he was fairly old school about that. 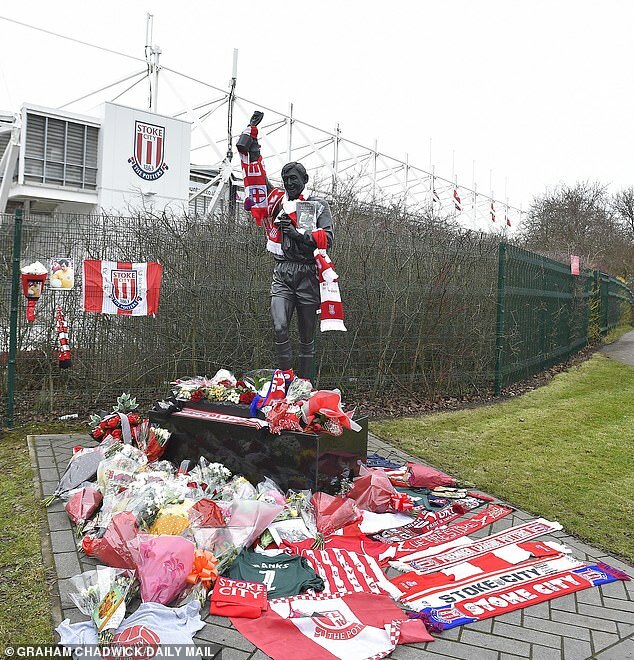 He would try to get to our games even when it was far too windy and cold..’ Around Butland dozens of Stoke fans listened in and waited to pay their respects. The tributes of flowers, shirts, and messages grew throughout the day. John Baddeley and his wife Pam, a couple in their fifties, laid a bouquet. John touched the back of the Banks monument, his eyes dewy. ‘I have met him a few times,’ John said. ‘He used to walk his dog near to us and we had the same doctor. What struck me was his modesty. He was an ordinary fella but an extraordinary talent. ‘When he played at Stoke it was as if he filled the goal and there was no way past. Everyone talks about the Pele save but for me his best was to stop Geoff Hurst’s penalty in the League Cup semi-final. Obviously Stoke went on to beat Chelsea at Wembley. ‘He is an adopted Potter,’ John said. ‘One of us.’ So it was fitting the Stoke squad and staff held a minute’s silence before Tuesday’s training session, forming a large loop around the centre circle, heads bowed. ‘We wanted to pay our respects,’ said manager Nathan Jones. ‘He is so important to the history of this club. 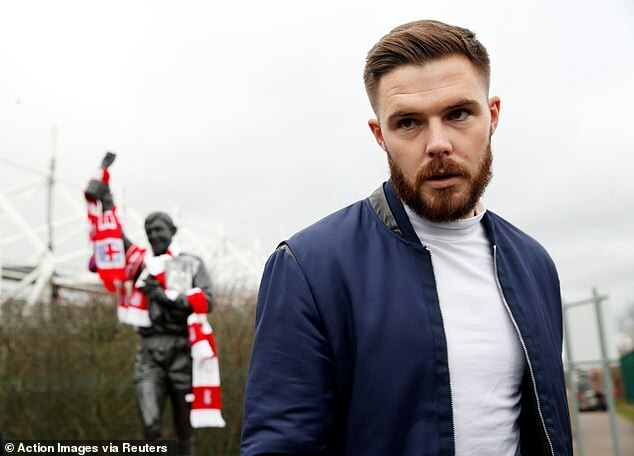 And also his aura is still here.’ Jones had planned to see Banks with Butland recently before being informed his illness would prohibit visitors.